Write It Down: "That Old 'H-B' Magic"
He speaks with an exaggerated drawl, which covers the dumb, goofy, and lovable qualities. The contrast of personalities works perfectly between the pairing of the lawman and his sidekick Baba Looey. One character is fast while another is slow. 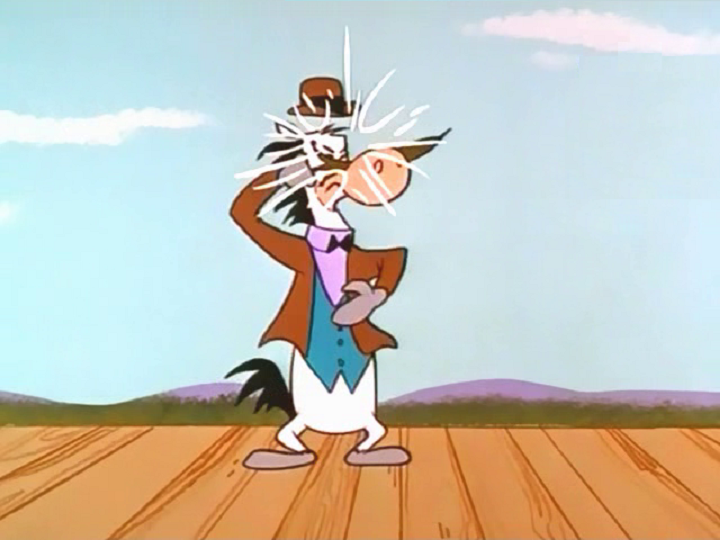 Baba Boy is in control of the situation in difference to the ineptitude Quick Draw McGraw displays. 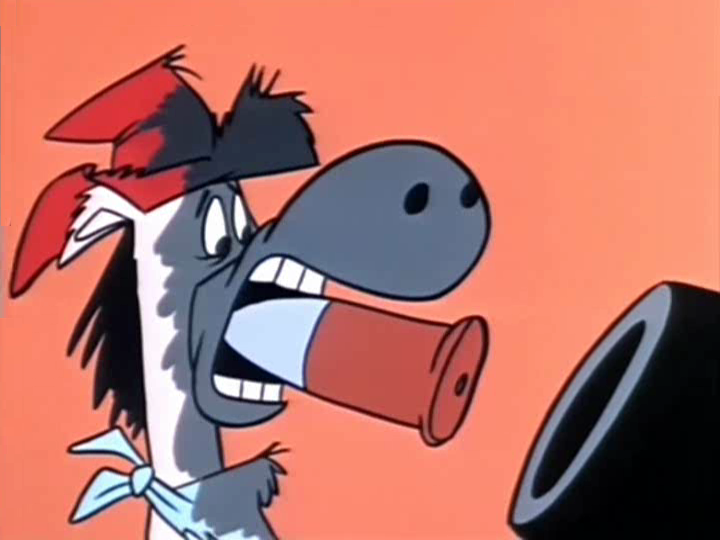 Only a goofy character like, Quick Draw was capable of mixing shooting, and blowing the smoke out of his gun. One of the running gags is how he will be the recipient of the inevitable gunshot, explosion, and possibly every calamity a cartoon character can withstand. 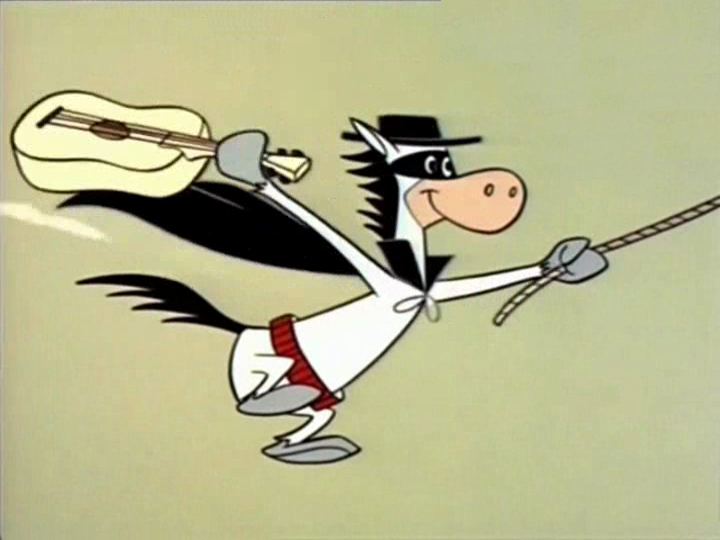 “Masking For Trouble” sees him as the Master Avenger, prior to his alter ego El Kabong. He shoots his foot when he is unable to get the gun unstuck from his holster. In “Chopping Spree” when Knotty Pine casually throws an axe, which happens to land into a hollow log where our hero happens to be hiding. 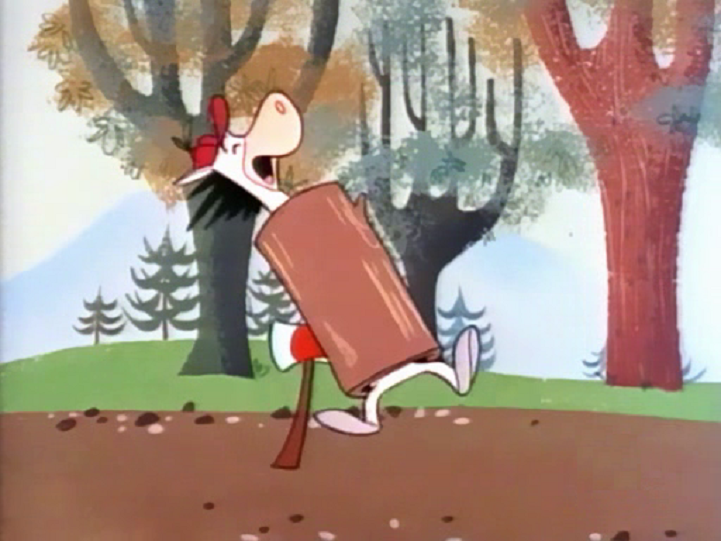 Shortly, he is running with the sharp instrument sticking from his posterior. (Looks like he suffered quite an axe-ident. 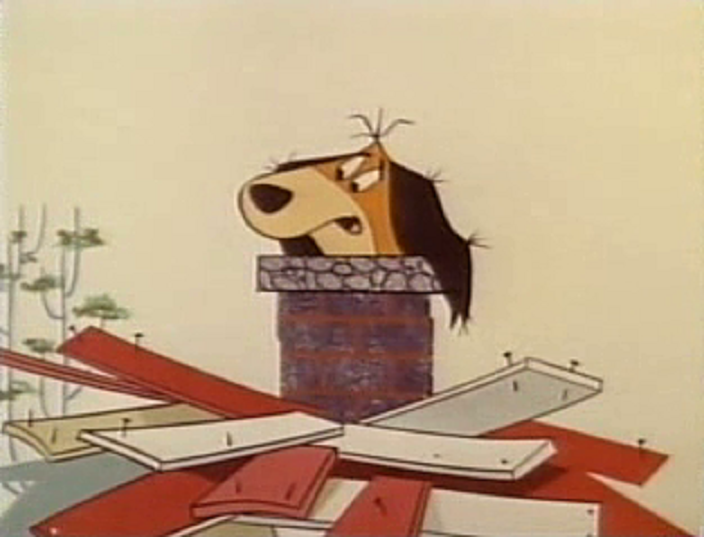 I am surprised Mike Maltese missed that pun) The spirit of a cartoon character can never be demolished! Although, lookout for that anvil falling. Like all Butler creations, when they loudly yelped or yowled in pain, you could sense the alarming pain they suffered. I will utter a “That smarts!” when injuring myself. For example, I prepared “scramb-led eggs” for the breakfast. I failed to take sight that the stove was on where I placed the plate. When I picked up the plate immediately I released it due to the scorching heat. “Ouch, ooch, ouch!” I expressed while I soaked my fingers in the cool water. 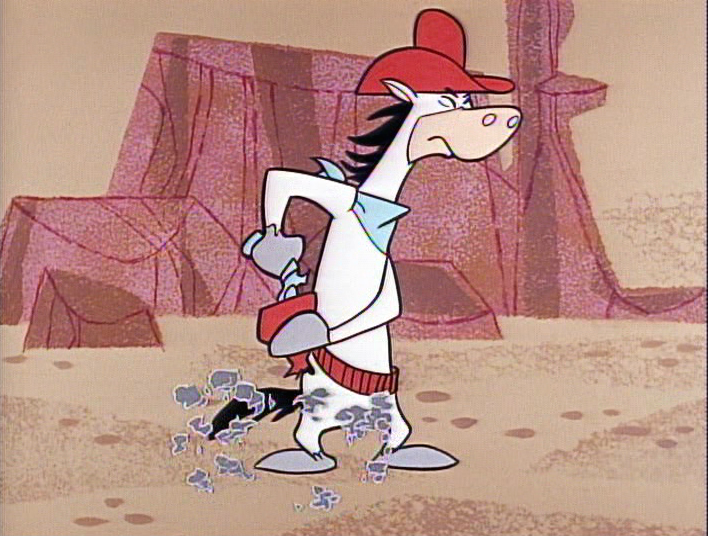 The appearances of “bis-ket” hungry dog Snuffles and his alter ego “El Kabong” adds freshness to the series. The animation of euphoric Snuffles as he hugged himself, while he ascended into the air was hilarious. The multitude of “Mmmms” Daws Butler provided for him enhanced the sensation he experienced. I liked when he doesn’t receive a treat, he will mutter (“Rassa’ Frassin”) under his breath and usually bite Quick Draw. 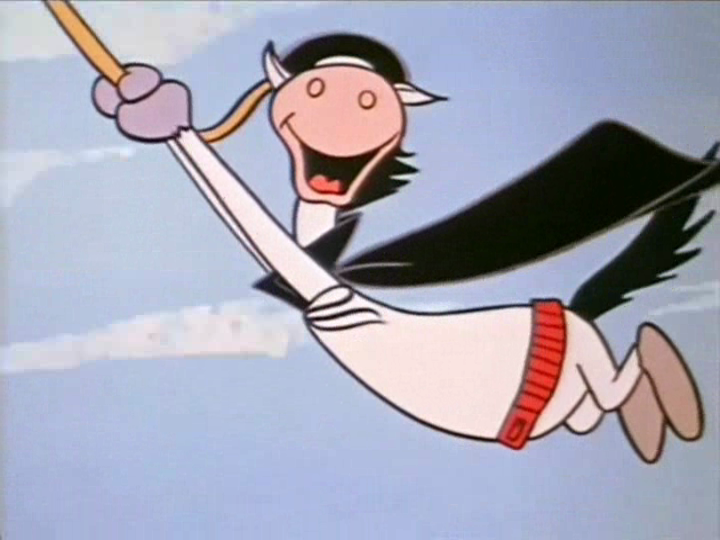 El Kabong hollers “Ole” as he swings from a rope, while bashing the baddies with a guitar (Or as it is properly referred to as a “Kabonger”) always delights me. In “El Kabong Strikes Again”, Mike Maltese lampoons how in the Douglas Fairbanks films there was a mystery of who the hero is underneath the mask. 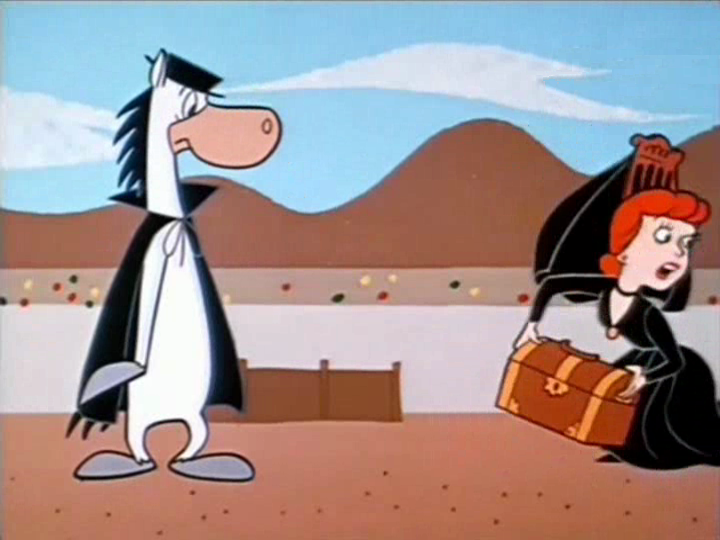 It is not extremely difficult to recognize a character with a distinct profile like Quick Draw McGraw. Señorita: Thank you, El Kabong. And may I see the handsome face behind the mask of my hero El Kabong? She is revolted upon seeing Quick Draw’s face and departs with the stolen money. It is a terrific twist on the traditional ending where the heroine happily runs away the hero. In the El-Kabong series Maltese tinkered with the idea of how during a swordfight, the protagonist and villain will breakout with a civil conversation. 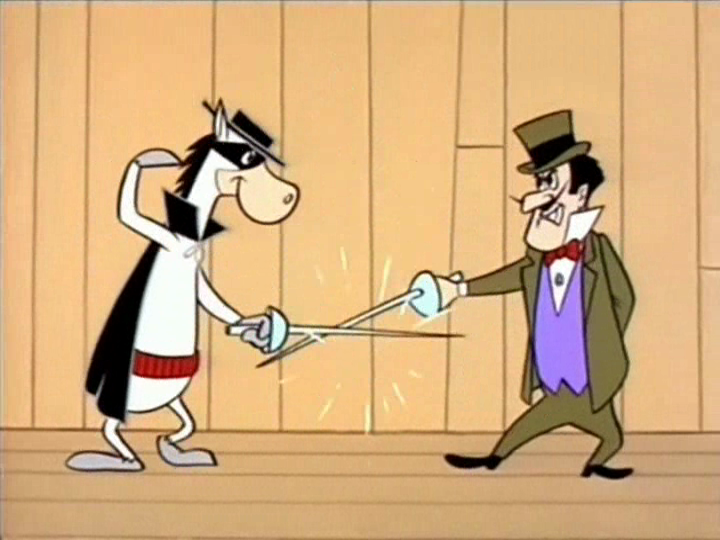 In “Who Is El Kabong” when he is sword fighting with the villain Norton South. The sword fight is temporarily halted. South: By the way, Kabong, I got your letter. I must say your grammar is atrocious. As grammatically incorrect as El Kabong’s response “It are?” sounds. I prefer using it to “It is”. 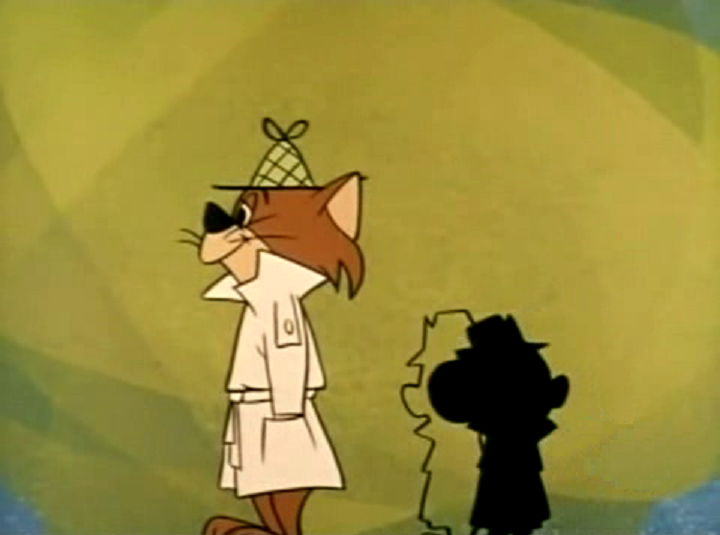 I have always enjoyed cartoon series where the protagonist wears a fedora, trench coat. What "Hanna-Barbera" were masters at in starting their studio was twisting the conventional pairing of animals. How about a cat and a dog (Ruff and Reddy)? 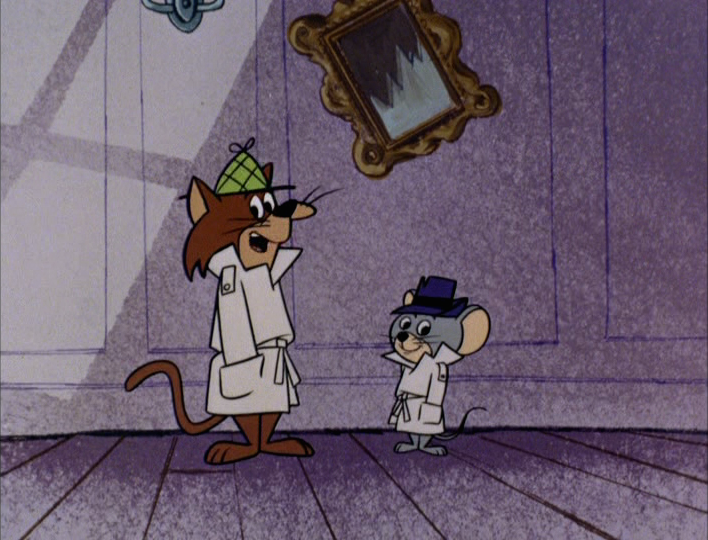 A cat and a mouse as detectives. What makes it perfect is while they're working in unison, moments of anarchy can arise. 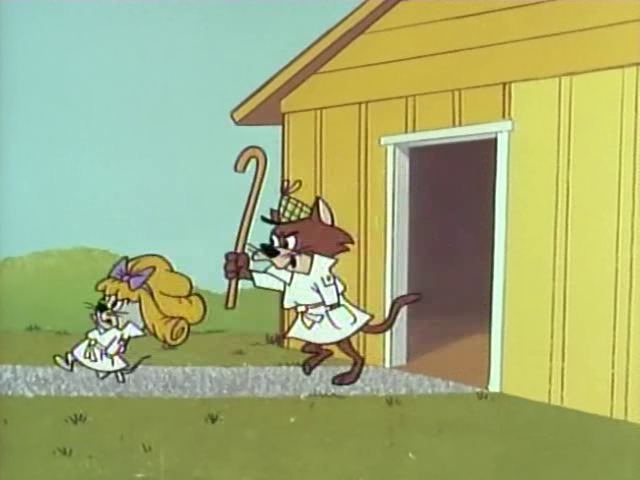 In "Bear-ly Able" when apprehending the Big Bad Wolf who is in drag. 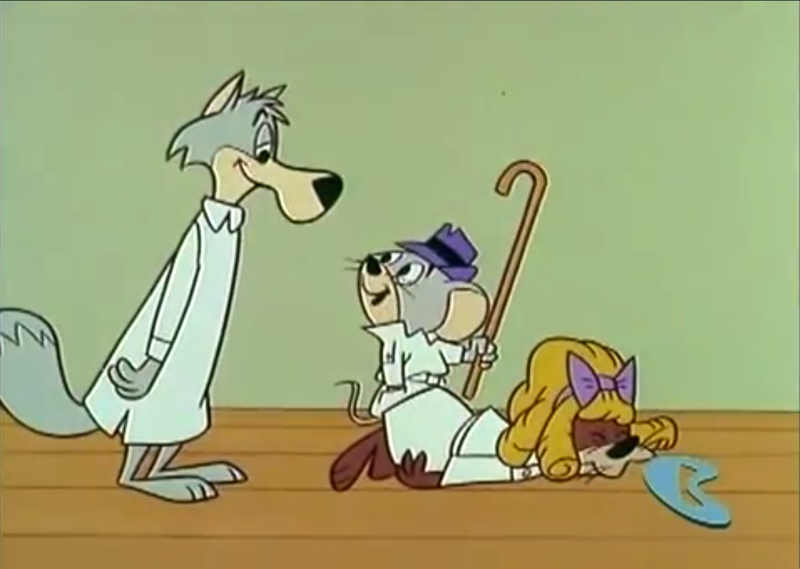 Snooper is about to run after him, however the Wolf trips him and places the wig on him. Blabber runs into the room only to notice his unconscious partner. "It's the wolf! That wig don't fool me! 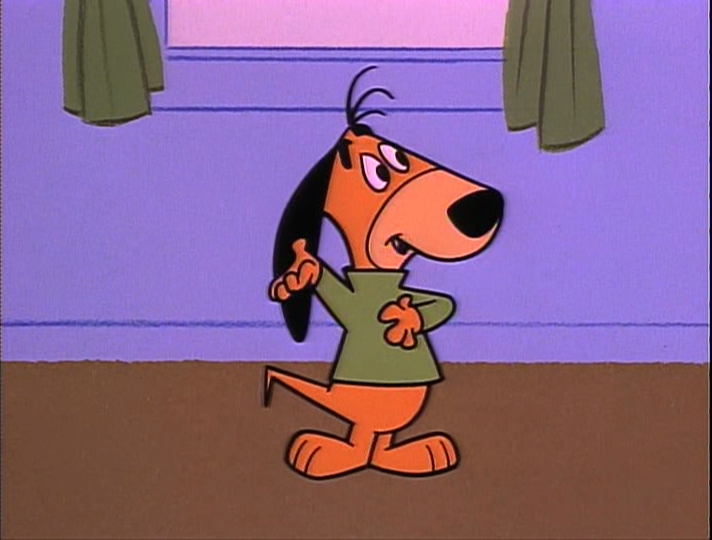 I like how involved Blabber is in clobbering Snooper with a cane. He says to the wolf standing next to him: "Boy, Snoop is sure going to proud of me by the way I caught you, huh?". 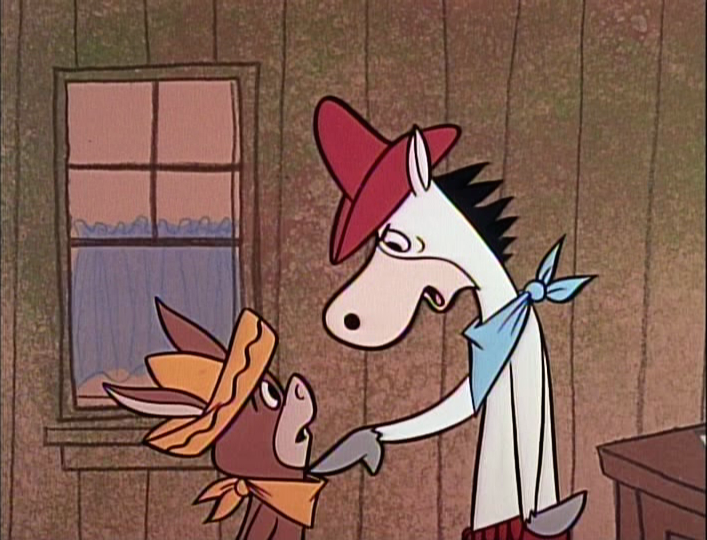 "He sure is sonny," replies the Wolf. Blabber shakes his head realizing what he has done. "Oh boy!" he expresses in embarrassment. "Does that mean I don't pass my private eye diploma?" inquires Blabber. The infuriated Snooper then plops the wig on Blabber's head. "Come back you little 'squeak-pip' and let me give you your diploma," says Snoop as he chases his assistant with a cane. Mike Maltese did a terrific turn of events with them chasing one another, instead of capturing the wolf. I liked how Phillip Green's score entitled "Custard Pie Capers" adds to the hilarity of the scene. "I don't know why I always say I am sorry Snoop," exclaims Blabber as the camera irises. It makes light of how the cartoons will usually end with him adoring his superior. 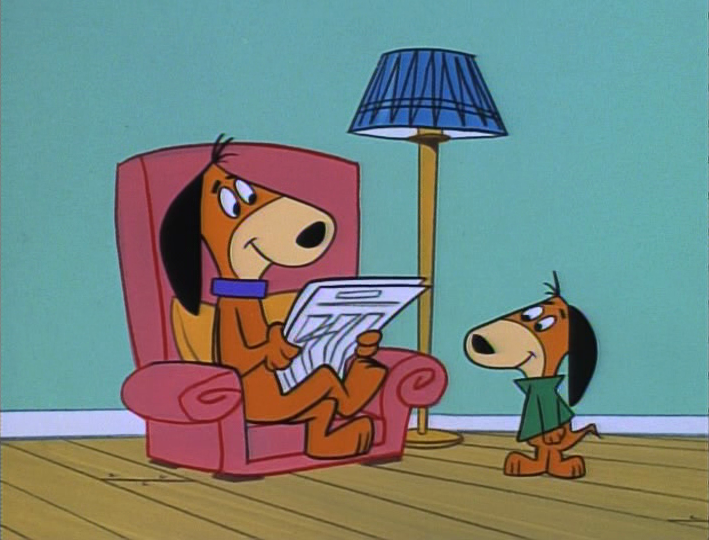 There will be situations where Snooper will allow Blabber to be in charge instead of an assistant. It was very nice of him as it gives Blab a sense of importance, which is crucial in a partnership. Especially as it is of the cat and mouse variety. In "Eenie, Geenie, Minie, Mo! ", Blabber is in tears of the prospect of him being the leader. 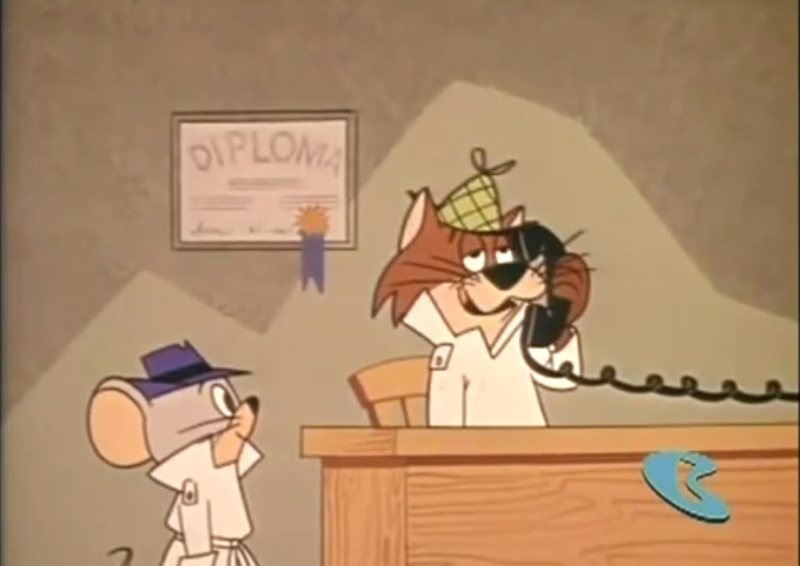 Prior to receiving a case Snooper will answer the client's phone in a rhyming motto. For example in "Real Gone Ghosts": "When other's fail, we'll stay on their trail." It was a perfect exhibition of the rhyming couplets that Maltese wrote for "Beep Beep The Road Runner" comic book stories for Western Publishing. The recurring clients who kept on hiring the pair made it interesting: Mr. and Mrs. J. Evil Scientist (a family who are known for their ghoulish eccentricities), or how about Toot Suite the french flea. There was the perfect opportunity for them to be involved with the fairy-tale characters ("The Three Bears", "Cinderella", "Jack and The Beanstalk",). 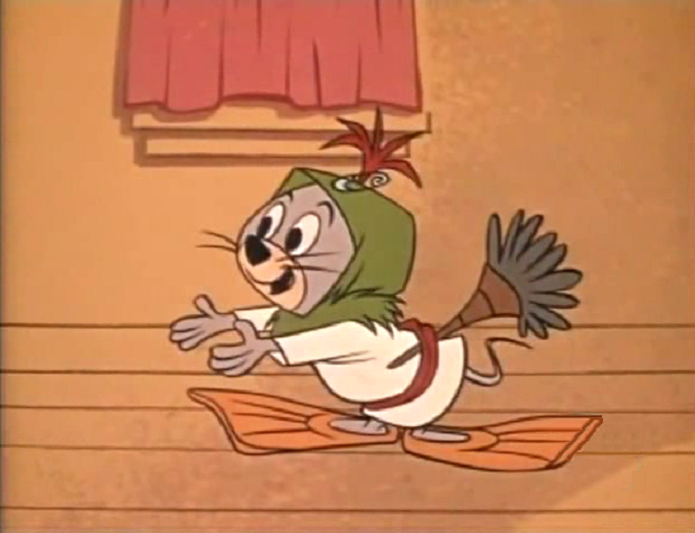 Maltese could include his wrangling of the traditional fairy-tale as he had done with Bugs and Daffy. 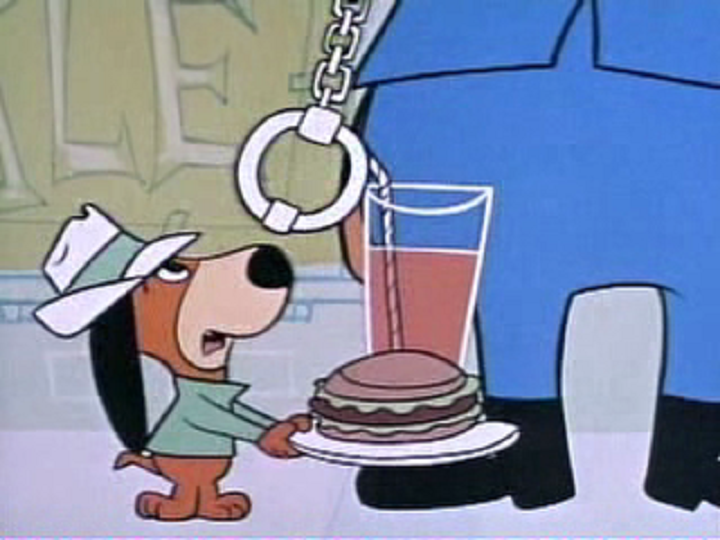 How about the "Dragnet" style interrogation that Snooper employs on the Jack in "Fee Fi Fo Fumble". Snoop will never stoop to violating his humanity, no matter how tempting the fee is. In the ending of "De-Duck-Tives" he forfeits the $30,000 reward, and allows the Tralfrazian duck to meet his mother, namely Blabber dressed as a duck. "Halt in the name of the private eye's writer's room!" exclaims Snooper. The pride he exuded from him regardless of how significant or slight Augie’s accomplishments were. I always enjoy it.In “Fuss N’ Feathers” Augie is pretending to be a chef. He is taking down his Doggie’s breakfast order in Fractured-french. “I will take three eggs le ‘scramb-led,” requests Doggie Daddy. “Three eggs ‘le scramb-led’ coming. Arrevderci, mon Papa,” says Augie. Doggie Daddy remarks to the audience “That’s my boy whose speakin’ Lithuanian.” That line was generated a gyser of guffaws from my dad and I. "Pup Plays Pop" during lunch Augie persuades Doggie for an extra slice of chocolate cake. Doggie:"But Augie, every loving son of mine. Two peices of choclate cake should be 'suf-fuff-icent' for lunch." Augie(energetically jumps): "Do I hear three? Huh. Do I? Do I?" Doggie (points):"Stop the motor! Stop the motor!" Augie:"You mean like, Oliver Twist, I'm to go empty plated?" Doggie:"I mean like, Little Jack Horner, you go sit in the corner. Now go." Augie: "Some day, when I'm a father. I'll know how to make my son happy." The displeasure Augie exhibits in his voice, the frowning expression, adds to the authenticity of his emotion he is experiencing. Maltese tinkers with the structure of a father and son sitcom. 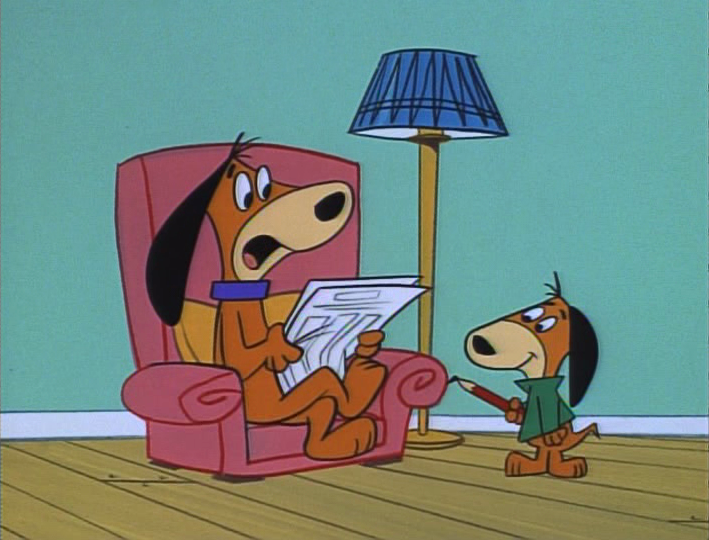 Augie then becomes the father, while Doggie is the son. The requests that Augie has for Doggie begins to have taken it's toll on him. On a tricycle, he whizzes past a police officer who pulls him over. Irish Cop:"Now what's the big idea of son?" Doggie:"I'm not the son officer. I'm what's left of the father." Irish Cop:"This is a new one. What's your story?" 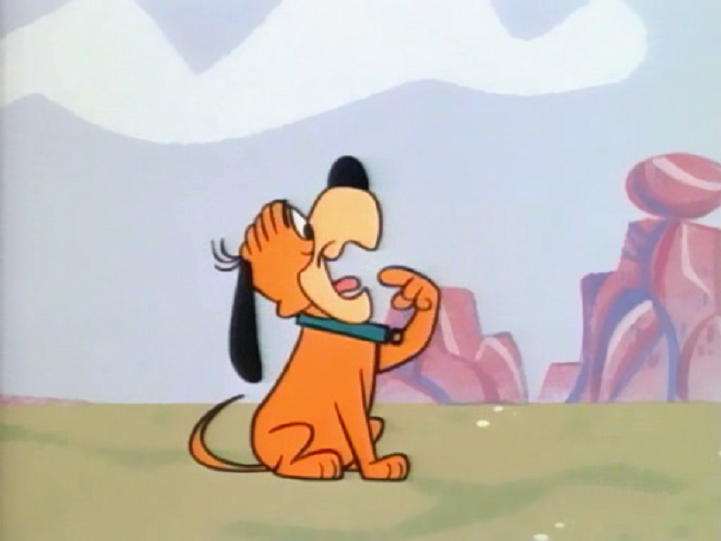 Doggie:"Well, it all started 'inner-cintly at break-a-fast, when I had to go and open my big mouth. Now, my son has been feeding it ever since." Augie: Now eat your rutabaga sand-a-which and your radish malted milk, and then we'll go to the amusement park. Irish Cop:"I'll take it from here." 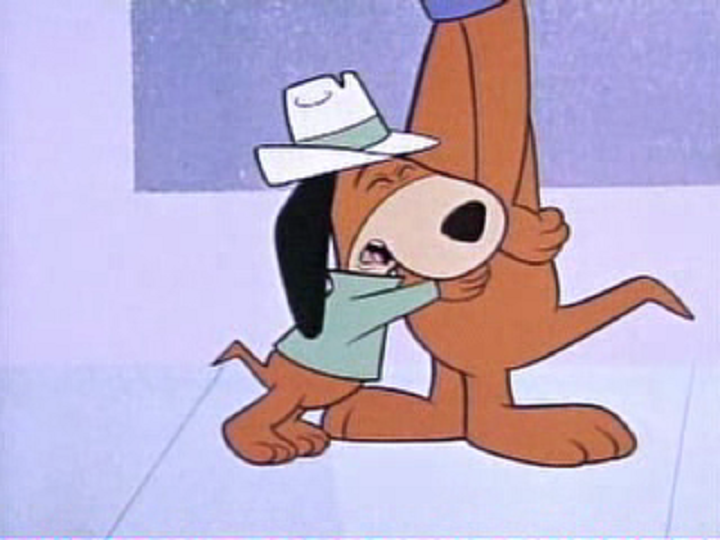 I like how the scene is layed out from the perspective of Augie with the fisticuffs dangling from the police officer.The animation of him tilting his neck as he gulps, adds to his trepidation of being arrested. He instantaneously surrenders in acting his age. It demonstrates the charm of being a child is problem free, in contrast to the responsibilities that an adult faces. The shot of Augie hugging Doggie Daddy's feet in addition to being cute shot, emphasizes the security he needs. What I appreciate is how Maltese straddles the line between sweet and silliness. It does not come off preachy. Augie:"And daddy dear, I promise from now on I'll only have two peices;Providing I can have three slices for lunch. Doggie: "I would have been awfully disappointed if he hadn't said that." All father's wishes for the best interests for their son; Doggie Daddy is no exception. "Watch Dog Augie" Doggie wants to know why Augie hasn't finished his homework to allow him to go to college. In reality he is reading a book entitled "How To Be A Watch Dog", eventually he can follow in his father's footsteps. In "Party Pooper Pop", Augie comes early from attending the neighbour's birthday party. He explains: "It's like I said dad. I'm not cut out for fun and frolic. I'm the studious type." Within the span of three seasons, Maltese matured him from the hyper-active pup to the boy genius. As an outcast from my colleagues in high school; It is a line that epitomizes my reclusiveness. When listening to their characterizations, you can extract the respect and tenderness in their relationship. 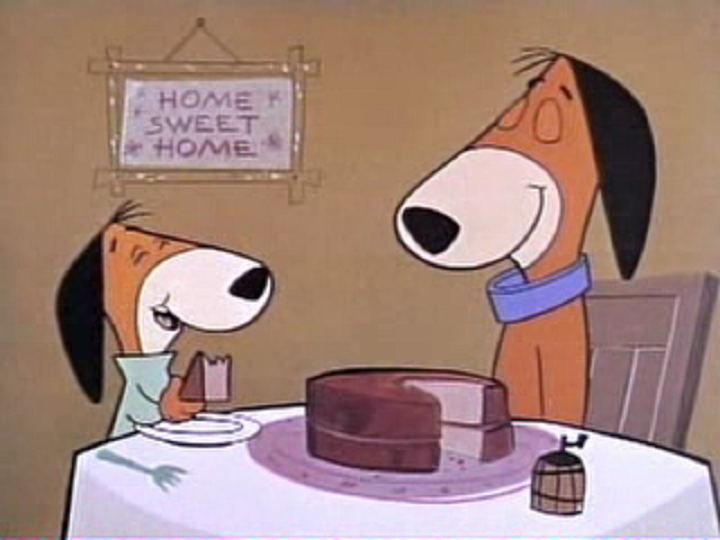 Daws Butler and Doug Young’s performances, as Augie and dear Doggie Daddy enhanced Michael Maltese’s droll dialogue. 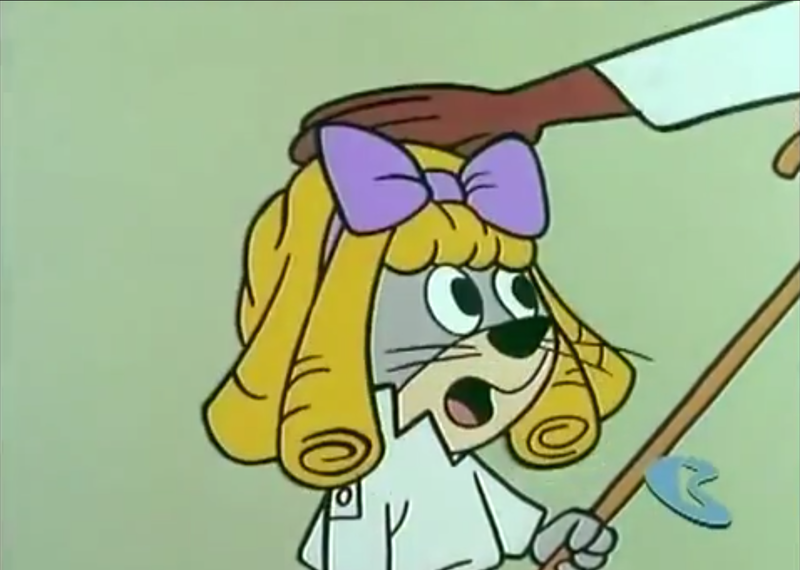 Maltese would utilize the preformer’s additions to the cartoon, as seen in “Little Wonder”. 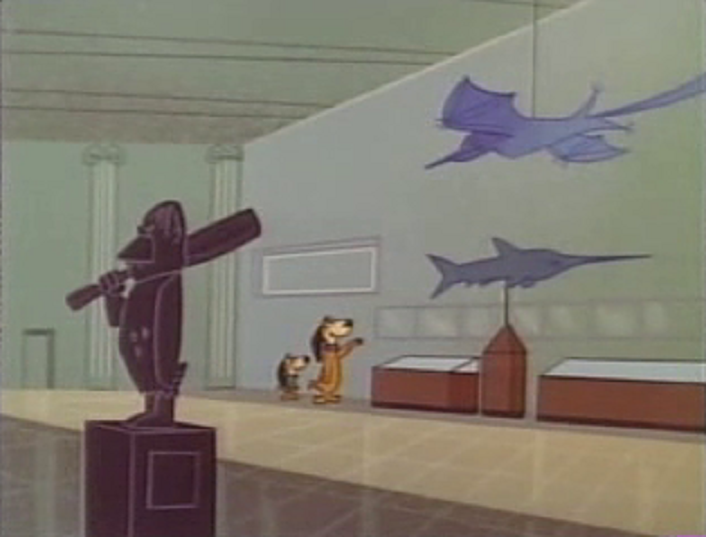 Doggie takes Augie to the museum in order to improve his IQ. Augie:(points to the exhibition): "What's that thing over there? Doggie: "That's a 'pre-hysterical monster, Augie boy"
Augie: "It looks to me like turkey leftovers." 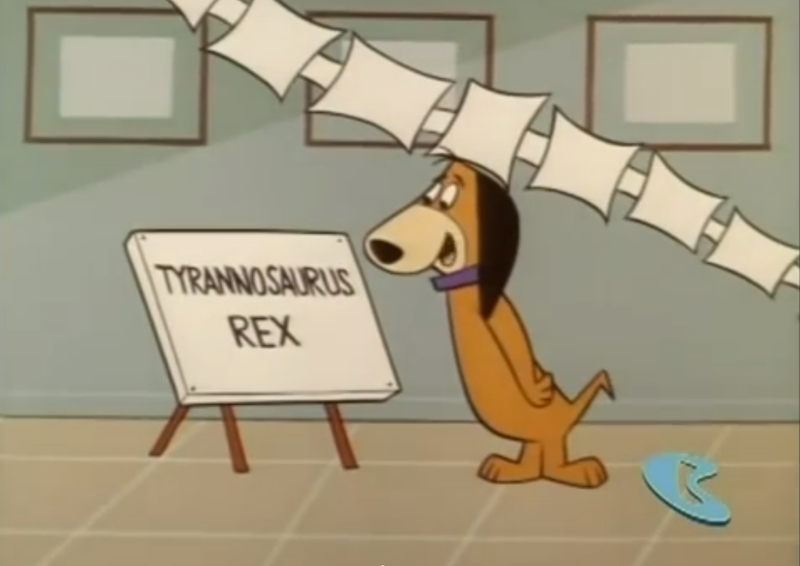 Doggie: "To be more exact, it is a - 'Tyrondo-roarious Rex'." I enjoyed how he mispronounced words, it adds to his clumsiness as a parent. He asks Augie to split an atom "scien-teh-tifically", by using a walnut for practice. Augie determines the distance where he can catapult a huge boulder from a tree onto the walnut. Instead, it demolishes into their house. Doggie:“Just a little around the edges Augie." Despite the damage Augie has caused, in the least he is calm. Once again Maltese at work with the right quotient of silly and sweet. It is an extremely touching line. When Augie would make Doggie Daddy proud, he delivers a hearty, “Dat’s my boy who did dat”; the affection they expressed reverberated into my relationship with my father. When viewing other dynamics between dad and son, I have yet to see a father and son who cared for each other like they did.